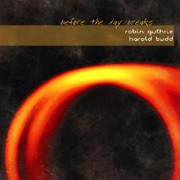 Robin Guthrie and Harold Budd recollect classical, new age and post-rock styles into a kind of ambient chamber music. 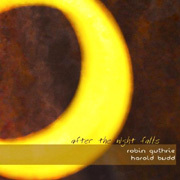 The collaboration After the Night Falls (38'21") and the accompanying Before the Day Breaks (43'05") are works of deep expression. Sometimes dreamy and at others passionate, their works are always performed as if in intimate touch with the listener. Every pluck, plunk, strum and thrum on these two CDs seems to emanate from the recesses of an enormous cavern as the sounds migrate through massive reverberation on their way to the listener. However nocturnal this music seems, light does filter in. Guthrie's drowsy guitar alternately finds itself in duet with, then in support of Budd's somber piano. Their work unfolds in a most gradual manner, prepared to coexist with the life around it. Together this duo paints a sound picture in a gentle measure of hushed tones and washes of pastel. Their music is admired for its simplicity, and ability to suggest absolute feeling. Free of reference to the material world, we should listen to this music before the surge of modern life overtakes us.